WASHINGTON (KUNA) — The US on Tuesday denied allegations that Secretary of State John Kerry attempted to have the Government of Ecuador shut down the transparency website WikiLeaks. WikiLeaks founder Julian Assange has been confined to the Ecuadorian embassy in London for four years, where he is avoiding extradition to Sweden and possibly the United States. 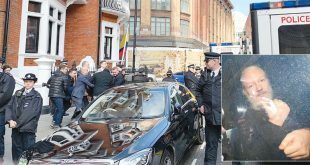 On Saturday, WikiLeaks said Ecuadorian officials cut off Assange’s internet access, and blamed Kerry, who they believe applied pressure on Ecuador to shut down the website and prevent the publication of email leaks that would be damaging to Democratic candidate Hillary Clinton. “We had no involvement in any way, shape or form in trying to shut down Mr. Assange’s access to the internet,” State Department Spokesperson Mark Toner told reporters. He added that Kerry had no meetings at all with the president of Ecuador while on a recent trip to Colombia, where WikiLeaks believes the intervention took place.